Unless you've been out of the loop these past few years, then you've probably noticed the versatility — and down-right adorable patterns — of washi tape. But the stand-in for standard office tape is more than just a way to decorate stationery. This budget-friendly product is also an easy decor item, and with a little ingenuity, it can add a creative touch to any room in your home. From an imaginative headboard to a shelving accent, and a wall mural to a kids' game, here are five ways you can use washi tape to enliven your space. Who says all headboards have to be made the same way? You can match your washi tape to your linens, and craft a headboard that's equal parts whimsical and architectural. Kids rooms are meant to be more fun than functional, so it's the perfect place for a washi tape mural. 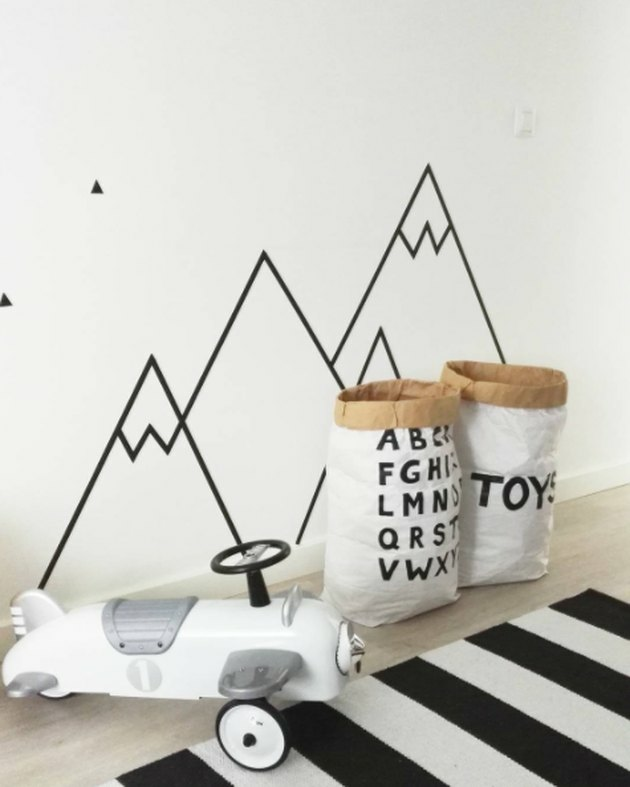 Take a tip from this example and make a cartoonish mountain design on a small section of a wall, which can also work to designate a "play" corner. Washi tape can also be used on the floor of a kids room in the shape of a game. Use different colors and sizes of tape to fashion a road, or use the supplies to craft your take on an existing game, like "Twister." The interiors of your kitchen cabinets probably don't get as much attention as the exteriors. But, put a strip of washi tape on their ledges — like the cheeky polka dot design of this example — and that might change. Washi tape is temporary, of course, so you can put it on items for a fresh detail that can be switched out when you're looking for something new. Take this planter, for instance. A dimensional design is a nice change, but you can easily revert back to the plain white finish when you want simplicity.